I guess he’ll like this shoulder bag. But as these examples suggest, guessing at Christmastime can be a terribly dangerous affair. As the pioneer in location-specific mobile auditing and research, Field Agent specializes in taking the guesswork out of decision-making. 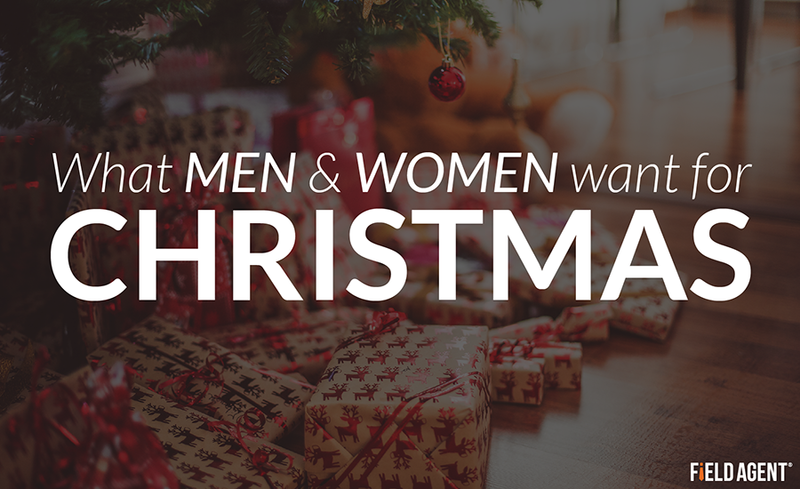 We recently surveyed 500 men and 500 women to identify the gifts adults really want for Christmas this year. Comparatively speaking, men show greater interest in electronics, while women demonstrate higher preference for gift cards/cash as well as wearable items (attire, watches, jewelry). The Top 10 gifts for both men and women are presented in the infographic below. Men in the survey were on average 37, while the average female respondent was 38. Be sure to check out the "honorable mention" gift ideas below the infographic, all of which received at least 3 responses from men and women. We asked the single question, "What one gift would you most like to receive at Christmas this year?" All responses were free form (i.e., qualitative). The survey did not offer predetermined choice options, to avoid influencing respondents' answers. For men (in descending order): tools, firearm, gift card, watch, electric razor, drone, furniture, trip/travel, book, bicycle, camera/accessories, cologne, grill, dog, golf club. For women: trip/travel, purse/backpack, video game, camera, furniture, coffee maker, TV, vacuum, perfume, book, pet, washer/dryer, desktop computer.